So, Messrs. DiMartino and Konietzko, creators of the phenomenal animated hit Avatar: The Last Airbender and its less impressive but workmanlike followup Legend of Korra, let me get this straight. You put together a well-respected children's show, and then, in the final thirty seconds, while you were donning your hats and coats and ducking out the back door of the studio, you tossed in some ambiguous homosexual innuendo that had little or no precedent in the story, and then you "pulled a Dumbledore," preening yourselves in public because you knew it would get you lauded by all the Right-Thinking People and invited to all the fashionable parties. You two used to be geniuses, but at an important moment, you lowered yourself to the level of a couple of pandering hacks. I will be much surprised if you produce anything of note after this; a man who drives off his muse in such uncouth fashion will be unlikely to woo her again. *Ahem. 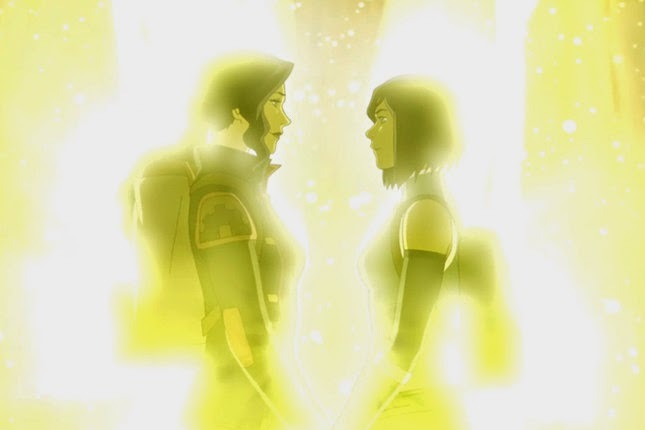 * In case you all haven't heard, Legend of Korra, the Nickelodeon children's fantasy cartoon with its roots in anime and Hong Kong chop-sockey, ended its run with a tacked-on sort-of-but-not-really love scene between its female lead Korra and this other girl Asami. Previously, these two were rivals for a guy, but at the last moment, without foreshadowing or any kind of setup, kicked him to the curb in favor of each other. I wasn't following the show myself, having been more-or-less satisfied with the wrap-up of the first season (which was originally planned as a one-off miniseries), but this ending sounds both ill-advised and unintentionally hilarious. In a little grassy bay between tall clumps of Mediterranean heather, two children, a little boy of about seven and a little girl who might have been a year older, were playing, very gravely and with all the focused attention of scientists intent on a labour of discovery, a rudimentary sexual game. Then, turning to his students, "What I'm going to tell you now," he said, "may sound incredible. But then, when you're not accustomed to history, most facts about the past do sound incredible." I am old enough to remember (and I am not very old) when all the proponents of the sexual agenda claimed they had no interest whatever in children. Indeed, we were told, the very idea was preposterous. Now, however, homosexuals demand children as trophies, to the point of having effectively created a new slave trade, and the so-called Antisocial Injustice Whiners . . . er, excuse me, Social Justice Warriors, are panting for depictions of sexual perversion in children's cartoons. Those of us with a lick of knowledge about human nature knew this was inevitable. When someone makes himself the enemy of innocence, corrupting children is always somewhere on his to-do list, even if it is not item number one, because children are symbols of innocence. Obviously, it's the "in a kids' cartoon" part we have a problem with. While I'm on the subject, let me speak for a moment about J. K. Rowling, whose notoriety Messrs. DiMartino and Konietzko are apparently trying to get a piece of. I'm going to go on record as the sole Christian blogger who defends Rowling's infamous statement about Dumbledore; what she said when asked was, "I always thought of Dumbledore as gay." Her choice of words was ignored in the hullabaloo that followed, but I think it important. She was speaking of her personal interpretation of her books, of what was in the back of her mind as she wrote. I daresay this was a temporary lapse, a momentary failure of the imagination on her part, being unable to conceive of a close companionship between men as anything other than homosexual, but at least she did not foist this interpretation on everybody else. Our intention with the last scene was to make it as clear as possible that yes, Korra and Asami have romantic feelings for each other. The moment where they enter the spirit portal symbolizes their evolution from being friends to being a couple. Many news outlets, bloggers, and fans picked up on this and didn’t find it ambiguous. For the most part, it seems like the point of the scene was understood and additional commentary wasn’t really needed from Bryan or me. But in case people were still questioning what happened in the last scene, I wanted to make a clear verbal statement to complement the show’s visual one. 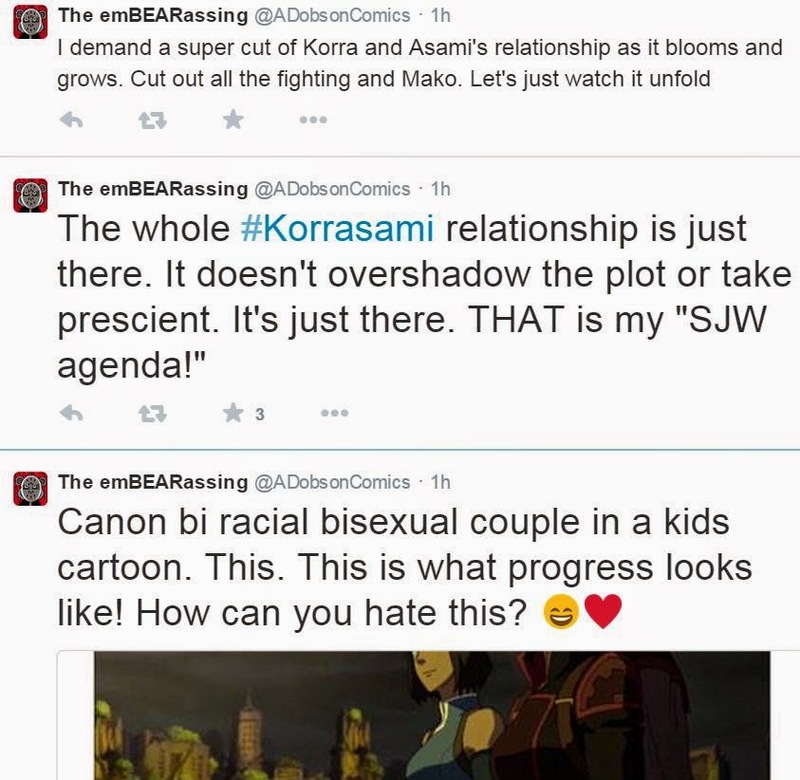 I didn't bother to watch Legend of Korra after the first season anyway, but there's more than enough commentary floating around to get a handle on this. The scene is ambiguous, necessarily so, because of its content or rather its lack thereof, creator claim to the contrary notwithstanding. Everyone I've seen talking about the subject says it comes out of left field, with no previous setup. Now, when ambiguity appears in a story, it is either deliberate or undeliberate. When ambiguity is deliberate, the savvy writer leaves it ambiguous when he talks about it after the fact, because he wants the audience members to mull it over and draw their own conclusions. When it is not deliberate, it means the artist has erred. What DiMartino is tacitly admitting here is that he lost command of his craft: a scene not meant to be ambiguous ended up being ambiguous anyway; otherwise, he would not have to explain it to us afterwards. That is shoddy storytelling. Nobody should be praising this. DiMartino has made this post hoc statement only because he is fishing for backslaps and invitations, because he knows the jet set will swoon over him. For pulling this childish stunt, he deserves scorn even from those who share his opinions. That he is instead being fawned over only demonstrates what some people, Larry Correia most particularly, have been saying of late: these so-called "SJWs" don't care about craft. They don't care about art. All they care is that a work check the right boxes on their cause célèbre list. I suspect Messrs. DiMartino and Konietzko are naïve. 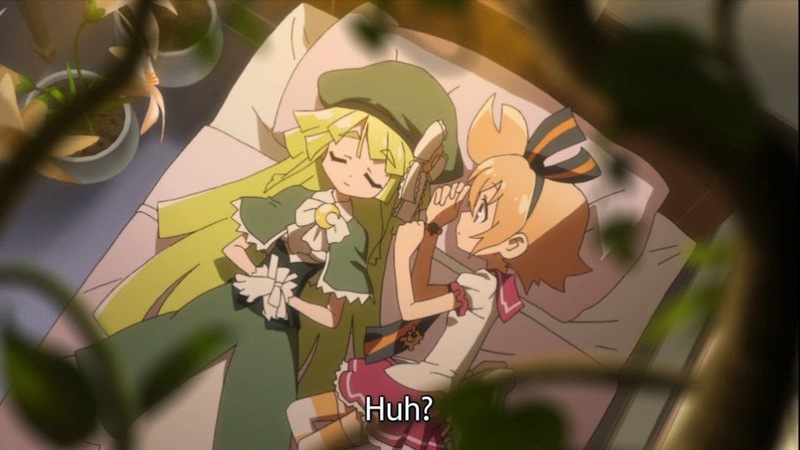 Coming as I do from both the Brony and the magical girl otaku fandoms, I know what kind of people usually demand to see lesbianism in their cartoons: those people are not "progressive" in any meaningful sense; they merely go along with whatever is Happening Now and look for excuses to justify their hangups. DiMartino and Konietzko have inadvertently pandered to the worst element in their fanbase, the guys who watch children's cartoons one-handed. No doubt DiMartino and Konietzko think they're striking a blow for freedom, but what they're really doing, in addition to pandering to paedophiles, is furthering the chilling of relationships and perpetuating stereotypes. It strikes me as strange that Leftists, who use stereotype as a swear-word, are so quick to leap to conclusions about people's sexual proclivities based on superficialities. No doubt any typical Leftist sitting in a bar, if he overheard a beer-swilling Conservative say, "Whoa! Two guys walking down the street! You know what they say about two guys walking down the street!" would heave a great groan, roll his eyes, and take his gin and tonic elsewhere. Yet that same Leftist says of a character like Korra from Legend of Korra, "Dude! A tough, bossy, athletic girl?! She is definitely a dyke!" Oh, except he wouldn't say "bossy." My mistake. Besides that, let's break down the actual content of the scene, shall we? Two girls clasp hands and look into each other's eyes . . . and that's about it. The only way to jump to the conclusion DiMartino wants us to jump to—insists that we jump to—is to begin with the assumption that all affection is sexual affection. Warm friendship is impossible in the world DiMartino and Konietzko and their ilk want to build, and that is why friendship today, especially between men, is so much colder than it was in your granddaddy's day. Friendship between women hasn't suffered quite so much, but don't worry: neckbeards who like to interpret affection between females in children's cartoons as proof of homosexuality are working very hard to fix that. 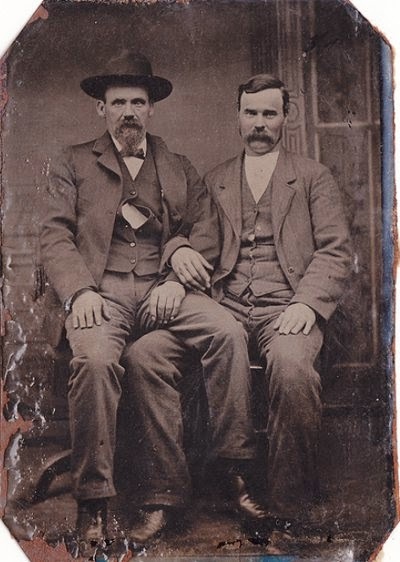 Dude, your granddaddy was so totally gay. Because Leftists are terminally myopic, believing history begins and ends with them, you might not know what I'm talking about. I recommend this little photo blog, which discusses the history of men's friendships, and how casual physical affection has disappeared from them as our society has become increasingly fixated on homosexuality. I saw this for myself when I was in India, where I saw men holding hands and held hands with a few men myself: close, warm, platonic friendship can only be possible in a society in which homosexual activity is proscribed, because only in such a society are the physical affections appropriate to friendship protected from misunderstanding and insinuation. I cannot throw my arms around a male friend or grasp his hand in America the way I can in India—but I could have a few generations ago. And while I'm on the subject, I must take a moment reply sarcastically to the bombastic verbosity of the Vanity Fair writer: yeaaah, ambiguous lesbians in an anime-influenced cartoony show? That is so totally brave and new and bold. That is so totally brave and new and bold, I have so totally never seen it before, like, ever . . . except four or five times just last week. I have seen it so much, I am bored to death with it. Seriously, get yourselves a new fixation. Your old one has grown dull. Whatserface and That Other Girl from Day Break Illusion. Man, that show is boring.